These must be the ultimate soul-deadening jobs imaginable to most designers, but as mentioned before, Konrad gets some kind of perverse pleasure out of doing these. The trick with road maps is to efficiently describe a route, i.e. mercilessly get rid of unnecessary information. Secondly, you need to think like the map reader thinks. One of the greatest stumbling blocks for designers is that – after a while – your view becomes too subjective, and you end up not realising that you've lost the reader. This is a free job Konrad does for NA – a non-profit association for drug addicts, run by ex-addicts. These maps get updated about once a month. *NA members actually refer to themselves as "recovering addicts", as a stark reminder that they're never free of their addictive nature, and therefore need to remain vigilant. Information about exact meeting locations is not always available, as it depends on info sent by various independent NA groups, but Konrad tries to be as accurate as possible by using existing map books and Google Maps. 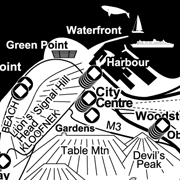 The benefit of online maps is that details can be changed at any time, without printing another batch. The problem with maps this complex though, is that if they get updated regularly, sooner or later they become chaotic and clunky, from too much information. So every few years it's time to thoroughly rearrange and edit the maps. The roads in the large Peninsula map have line widths based on each road's maximum speed and amount of lanes in it. That way the reader can clearly see which roads are easier to take, whereas on traditional maps, a National Road would be much more prominent than an "M" road, even if the "M" road has more lanes or a higher speed limit. Konrad believes in taking into account perception, as well as being pragmatic. The maps are in black line art only, since they usually get photostated, and we're sure you've seen what happens when you try to photocopy full colour maps or maps with gradients. Finally, these maps are not saved as images in the PDF, e.g. as JPEG's, because the file size would absolutely balloon with those, so Konrad saves the maps as vector art*, which keeps the PDF small enough for anyone to download with ease. Another benefit is that one can zoom in infinitely many times to get details you might not notice when viewing the whole page on a monitor. *Vector art is an image described by several points' coordinates, e.g. point A is at 22mm to the right, and 232 mm down; which connects via a straight line to point B etc. In the case of pixel/raster art like JPEG's, every pixel in every row and column must be described. Maps and most logos are typically saved as vector art.